Shaftesbury Square has said goodbye Speranza after over 30 years in business in response to the changing face of area, with the opening of an American Italian styled eatery, Brooklyn SQ. The owners of one of Belfast’s longest standing Italian restaurants have closed the doors making way for a new business venture. Shaftesbury Square has said goodbye to Speranza after over 30 years in business in response to the changing face of area. The proprietors are giving the prime city centre location a new lease of life with the opening of an American Italian styled eatery, Brooklyn SQ. A £150,000 renovation of the three-storey building that housed Speranza Restaurant has transformed the newly named Brooklyn Sq into a casual dining American-Italian warehouse style dining experience. The restaurant currently employs 25 staff with numbers increasing to 40 following the extensive renovation project. The 150-seater restaurant will be illuminated by a 2.4m metre neon sign adding to the Times Square look of the area. Italian restaurant Speranza opened in 1983 and has welcomed a host of famous faces through its doors including Lady Gaga, Brad Pitt and Justin Bieber. The restaurant once famed for serving its signature dish chicken speranza, a chicken Kiev stuffed with pate, will make way for a new concept in dining by the Fanning Family who bought the Shaftesbury Square location over a decade ago. 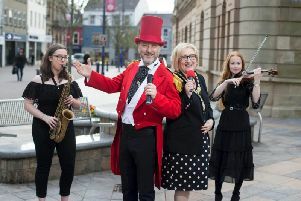 Darren Fanning said: “The dynamics of the area have greatly changed with the rise of the Cathedral Quarter but we’re at the beginning of the shift to see Shaftesbury Square restored to its former glory. “There’s a host of new residential and student apartments being built on Dublin Road and the area will soon benefit from the urban villages renewable scheme and the rapid transport system. “We’re excited to be part of the change to the area too. Popularity for casual dining has soared and we’re excited to unveil our new concept Brooklyn SQ in the coming weeks. Brooklyn SQ will serve a range of pasta dishes, sizzling plates, a range of steak cuts, pizza and ribs and is open for breakfast, lunch and dinner seven days a week. Visit Facebook.com/BrooklynSqBelfast to find out more.